Some of you may be wondering, what is Victoria's favorite dish? Really, what is it? Sometimes that's difficult to answer, because there are so many foods I enjoy! I can formulate a short list of foods I would consume in my last week on Earth if that helps: French onion soup, eggs Benedict, chicken tikka masala, beluga caviar (straight-up or on some bread with butter), baked macaroni and cheese, and of course the ultimate in awesome food, my childhood favorite with an eternal place in my heart, the dish that both of my grandmothers have made for me and with me, where I learned the art of cooking, my ever-so beloved manti, the greatest dish on Earth. Did I lose you yet? 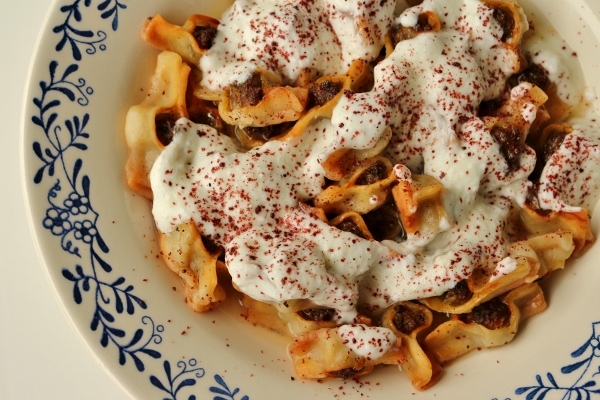 I'm sure many of you have never heard of this dish, but if you've heard of it, or had the pleasure of eating it, you probably know where I'm coming from, and why I feel so strongly about it. Some people take short-cuts and use wonton wrappers. This is as wrong to me as it is wrong to a native Italian to use store-bought wonton wrappers for their ravioli (sorry Giada, I love you, but it's just not the same!). 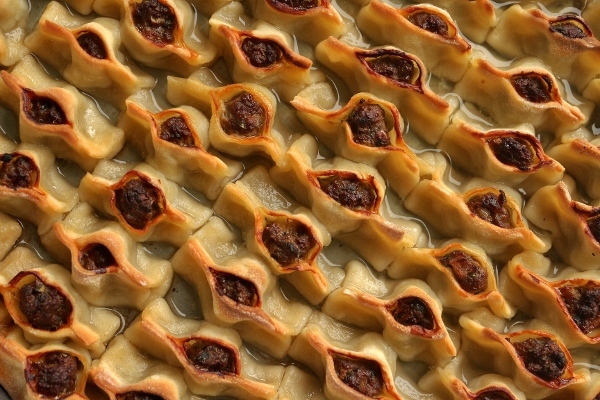 Manti is a tedious process (not unlike making ravioli), and ever since I was very young, I remember both of my Armenian grandmothers making manti, and I was always there to help. It was a treat to have manti for dinner, because it wasn't a quick meal, and we would always make an extra tray or two to freeze for future meals. Or at least that was the plan. Manti rarely made it to the freezer. It usually ended up in our stomachs... complete manti coma. There are actually two kinds of manti. 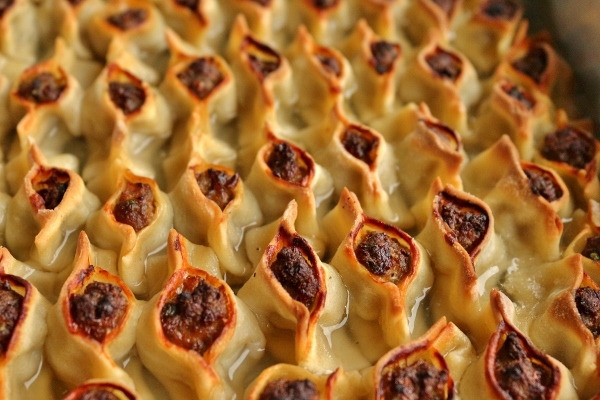 My favorite is the baked manti (called sini manti in Turkish), but there's also a version cooked in broth as a soup (sulu manti), and although they are prepared the same general way, they are shaped differently and cooked in broth instead of baked in the oven. 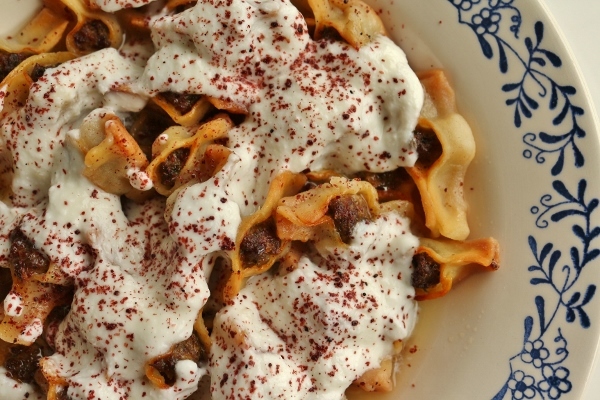 These canoe-shaped dumplings are served topped with a yogurt-garlic sauce (which I've mentioned in a past post on making homemade yogurt) and sumac, that lovely, tart, purple Middle-Eastern spice. 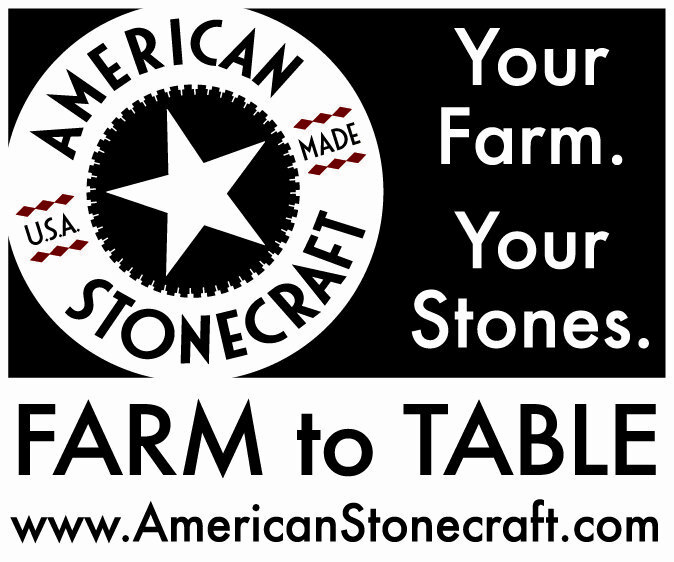 Years ago, my grandmothers would roll out the dough with a rolling pin, and cut it with a knife into squares for assembly. Since then, a hand-cranked pasta rolling machine has made life easier, and a pizza cutter has replaced the knife for faster cutting. If you have a Kitchenaid pasta roller attachment, I highly recommend it to make manti even faster, because the faster it's made, the faster we can eat it! It still helps to have an extra pair of hands (or more) to assemble these morsels because even with the newest dough-rolling technology, they can be a lot of work, but so worth it! *Update 10/4/14* I have tweaked the oven temperature and cooking time for this manti recipe, and I have also replaced all the original pictures with new ones! Woohoo! To make the dough, fill a large mixing bowl with the flour and make a well in the center. Beat together the eggs, salt, water, and olive oil. Add the wet ingredients to the well. Slowly incorporate the flour into the wet ingredients until a ball of dough is formed (alternatively add the flour to the mixer bowl of a stand mixer, add the wet ingredients, and use the dough hook attachment to make the dough). The dough will be somewhat sticky so add a bit of flour as needed, and knead the dough until smooth. Cover the dough with a tea towel and set aside for 30 minutes. Preheat the oven to 400 degrees F. Grease 2 (13 by 9-inch) baking pans with butter and set aside. Mix together the ground beef, onion, parsley, salt, pepper, and paprika until well incorporated. Refrigerate until needed. Using a pasta roller or a rolling pin, in batches roll out the dough until it very thin, dusting the dough with flour as needed (using the Kitchenaid pasta roller attachment, roll until #4 for thickness). Cut each strip of dough into 1 1/2 inch squares. 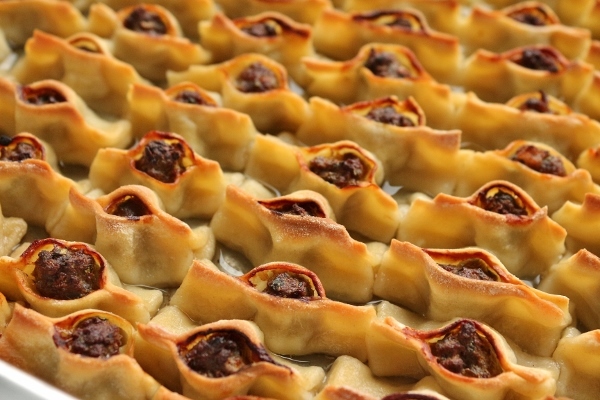 Place 1 teaspoon of meat filling into the center of each square and pinch the two ends with your fingers to form a canoe-shaped dumpling. Repeat with the remaining dough and meat filling. 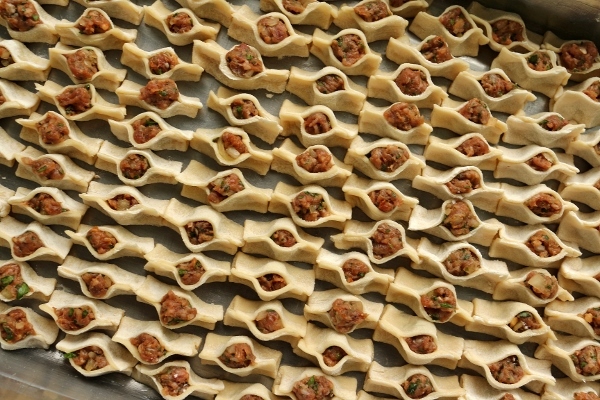 Arrange the manti close together in the buttered pans. 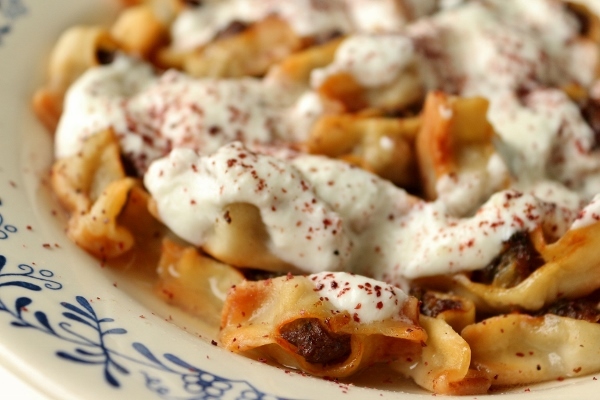 Dot the tops of the manti with bits of butter, and bake for about 35 to 40 minutes, or until golden brown. Meanwhile, mix the yogurt and garlic, and season with salt. Set aside. Add the chicken broth and water to a saucepan and season with salt and pepper. Bring to a simmer. When the manti are golden brown, remove the pans from the oven and ladle the broth mixture over the manti. The broth should fill the pan about 3/4 of the way up the manti. Reserve the rest of the broth for serving. Return the pans to the oven and bake for 10 minutes longer until most of the broth is absorbed into the manti, and about 1/4-inch of broth remains on the bottom. They will have a firmer than al dente texture, with a slight crunch at the ends, but you can bake them longer with the broth if you want a slightly softer texture. 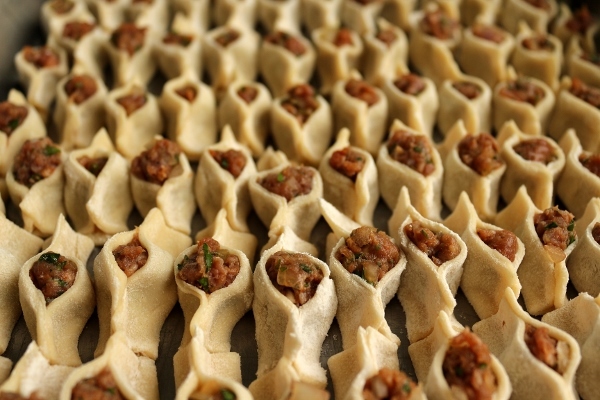 Remove the pans from the oven and serve manti in individual wide bowls, ladling some more of the hot broth over it. 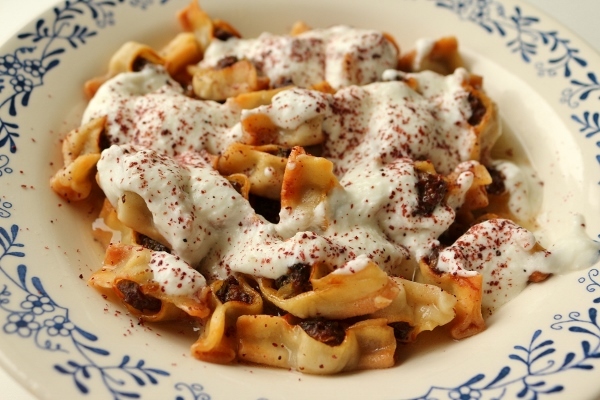 Top with yogurt-garlic sauce and sumac. Enjoy! Giveaway, Blogger Tag, and Awards, Oh My!